Anderson-Negele is adding sales and service offices on the Indian subcontinent to create a full-coverage service network in Asia. India is the world’s largest milk producer. In 2010/11, annual milk production reached 116.2 million tonnes, corresponding to around 16% of international milk production. Anderson-Negele is adding sales and service offices on the Indian subcontinent to create a full-coverage service network in Asia. India is the world's largest milk producer. In 2010/11, annual milk production reached 116.2 million tonnes, corresponding to around 16% of international milk production. Sales, service and marketing are handled by a staff of five employees. In addition to the headquarters in Mumbai, additional offices are located in Delhi and Bangalore. In Asia, Anderson-Negele now provides the fast and reliable service that our customers have come to trust not only in China but in India as well. 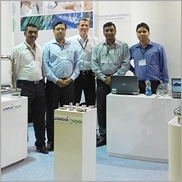 In August of this year, the new Indian team had its own booth at the DairyTech India for the first time. The trade fair is the largest in Indian for milk production and focussed on food safety and resource efficiency. The positive response from the many visitors to the booth made the trade fair exhibit a complete success.